Using Facebook Ads is one of the most effective social media marketing tools at your disposal, especially for creating a strong audience of users who might become potential buyers, and Facebook makes it very easy for you to accomplish your marketing objectives. If youâ&#x20AC;&#x2122;re totally new to Facebook advertising, and donâ&#x20AC;&#x2122;t have much of an idea about how to get started, the discussion below should help you kick off your very first Facebook Ad campaign. 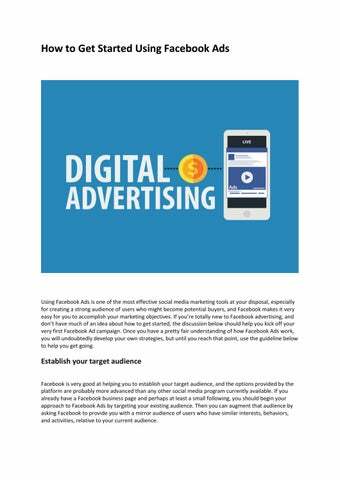 Once you have a pretty fair understanding of how Facebook Ads work, you will undoubtedly develop your own strategies, but until you reach that point, use the guideline below to help you get going. Establish your target audience Facebook is very good at helping you to establish your target audience, and the options provided by the platform are probably more advanced than any other social media program currently available. If you already have a Facebook business page and perhaps at least a small following, you should begin your approach to Facebook Ads by targeting your existing audience. Then you can augment that audience by asking Facebook to provide you with a mirror audience of users who have similar interests, behaviors, and activities, relative to your current audience. Providing graphics and images for your Ads When you’re trying to gather graphics and images to use with your Facebook Ads, you should avoid the temptation of including your own picture, because chances are very few people know you, and that means they won’t respond to your Ad. You’re much better off including some high resolution graphics and images which you think may have genuine appeal to your target audience, and which they will probably relate to. Keep in mind that when you are running an Ad Graphic in Facebook, only 20% of that Ad can have text associated with it. This shouldn’t be an issue though, because Facebook provides a grid tool for you to test your graphics before uploading them. Types of Facebook ads There are three primary kinds of Facebook Ads, with those three being mobile ads, newsfeed ads, and sidebar ads. If you’re starting out with a tight budget, you’re probably best off to begin with the newsfeed add, and that’s the type which shows up in people’s newsfeeds, very much like any other kind of Facebook post. Facebook will inform you about the precise dimensions which should be used in your ad, although you’re generally safe if you stick with 1200×628. Mobile ads will of course, look a little different than the ones which show up on desktop computers, and when you’re setting up your mobile ad, you’ll get a preview of it in your dashboard. Text for your Facebook ads When you’re creating your Facebook Ad, you should come up with a headline to use and place it below the image, with some kind of description. The really critical text for your ad should be placed right above your image, and one of the most effective kinds of text you can post here is an obvious ‘yes’ question. For instance, you can pose a question to users such as, “Would you like to have more free time every day of the week?” Then you can supply the answer yourself, with text that promotes your product or service, and informs the user how your product can solve this particular problem. Included in your problem resolution sentences, you should also provide a hyperlink to your website, or to the specific product which is going to offer a solution to the user’s problems. How to create your ads There are two options available to you for creating your Ads in Facebook, one being the Ad Creator tool and the other being Power Editor. It’s considerably easier to use the Ad Creator tool, although it does include a limitation of 90 characters of text, whereas Power Editor has no text limitation at all. Your best approach is to set up an ad from scratch rather than using an existing post, because you have a lot more flexibility with a brand-new ad. Either of the two ad creation tools will allow you to choose some kind of call to action button, such as ‘click here’, ‘download now’, or ‘watch now’, and this button can be placed just below the graphic in your Facebook Ad. Changing your ads The best ways to determine if your ads are effective or not is to closely monitor your cost per lead or cost per sale. If you’re paying less than $5 per lead, you’re doing pretty well, and it’s probably to your advantage to keep the current ad running for a while. If your cost per lead is above $5, you may want to consider changing something about your ad. The first thing you should probably tweak is to change your image or graphic, because it’s the easiest and the smallest change you can make. If that produces no positive results, then it’s time to change your text and your pitch. However, before you consider making any serious changes to your ad, you should go back and re-check your target audience, to make sure you’re advertising to the right group. It makes all the difference in the world when you’re making a pitch to a receptive audience, versus one that has no interest in your products or services. Help with your Facebook Ads If you need help with those first few Facebook Ads, you may also want to enlist the aid of a top-notch digital agency which has years of experience in setting up these kinds of Ads. 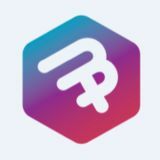 Small business marketing is a specialty for many such agencies, and an agency like Studio MFP can offer a whole range of other services as well, including SEO optimization, website design, and virtual assistance. Contact Studio MFP for consultation on Facebook Ads and any other services you may need in the area of social media marketing. Using Facebook Ads is one of the most effective social media marketing tools at your disposal, especially for creating a strong audience of users who might become potential buyers, and Facebook makes it very easy for you to accomplish your marketing objectives.